Every time I make a soup that has some sort of garnish, I swear that I will never make an un-garnished soup again. Then you get months and months of plain soup, until I stumble upon another garnished soup and the process begins again. I am never making an un-garnished soup again. Most of you know that I joined a bean club and get regular shipments of beans from Rancho Gordo. Along with their fabulous beans, I have their fabulous cookbook, Heirloom Beans: Great Recipes for Dips and Spreads, Soups and Stews, Salads and Salsas, and Much More from Rancho Gordo – well I’ve gotten a little behind on my beans and have a huge basket full of them. So, I pulled out the cookbook and started looking. I immediately found Borlotti Minestrone with Arugula Pesto. I was a smidgen doubtful because it had no meat – not even the ubiquitous ham bone. But what it did have was arugula pesto. I love pesto in any way, all ways, all the time. So swallowing my doubts (and spoonfuls of arugula pesto) I made it. It was wonderful!!! The fennel added a lovely touch and the flavors blended together beautifully. The pesto added a brightness to the soup. The recipe makes plenty of pesto which is great on sandwiches or stirred into rice or pasta. This healthy Borlotti Miinestrone is so easy to make and it gets a burst of fresh flavor from the arugula pesto! In a soup pot over medium heat, warm the olive oil. Add the onion, garlic, fennel, and pinch of salt and saute until the vegetables are soft and fragrant about 10 minutes. Add the cabbage, stir to coat with oil and cook until it’s wilted – about 5 minutes. Add the broth, another pinch of salt. Bring to a boil and simmer uncovered for about 15 minutes. Add the green beans and the borlotti beans and simmer for 15 minutes. Season with salt and pepper. 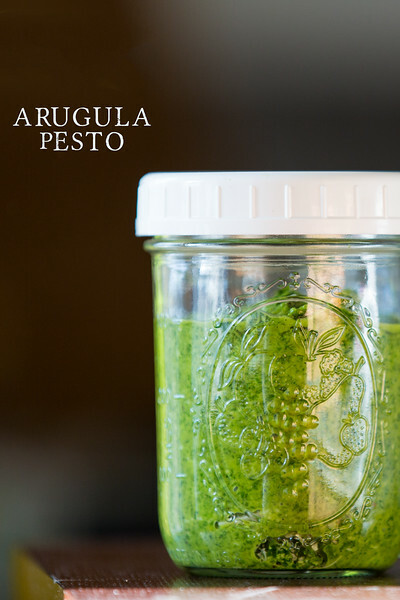 For the pesto – Put the garlic, arugula, parsley and a pinch of salt in a food processer. Process until well chopped. With the motor running slowly drizzle in the olive oil, stopping to scrape down the sides of the bowl if needed. Add the Parmesand the lemon juice and season with salt and pepper. Ladle the soup into bowls and top with a dollop of pesto. Store any leftover pesto in the fridge for up to a week. (I froze some of mine). Sidewalk Shoes is a member in the Amazon affiliate program. I LOVE arugula pesto but would never have though to add it to a soup. What a great idea! Nothing is more comforting than a bowl of warm bean soup This looks amazing! I love the idea of stirring extra flavor into soup withe pesto. I just bought some stinging nettles yesterday, I think making some soup is also in order. Thanks for the idea. I’ve never tried stinging nettles. Bean club or not, this is one fabulous soup. I love the arugula pesto as well. Arugula pesto adds such an interesting bite to it! I’ve been loving pasta with pesto and wilted arugula. I’ll have to try some arugula pesto next! What an amazing version of minestrone. I could go for a bowl right now! I like fennel a lot, but I have never added it to soups for fear of overwhelming the other flavors. I’ll be more daring next time. Love the bright green of the pesto. I am with you–soups with good toppings and garnishes are usually my favorites. 😉 Thanks for sharing this one with Souper Sundays. I love the beans with the pesto combination. I have exactly the same amnesia about garnished soup, so funny! Love this! Arugula pesto is a new one for me although I did just have an artichoke pesto that was fabulous! I’ll have to give this a try. I’m allergic to nuts so I make my pesto with toasted pumpkin seeds. Sounds delish! I’m sure there is more winter to be had, and this sounds warm and wonderful! if i was ever going to join a club that sent foods to my door, it’d be a bean club. no question. 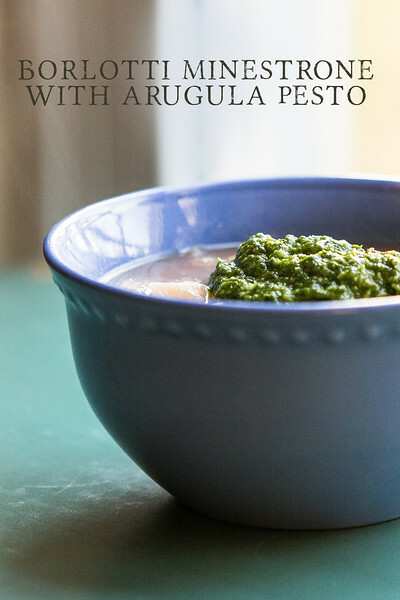 LOVE pesto of any kind, and this sounds like a marvelous soup! How lovely! Are you doing the year of beans this year also?? I signed up after hearing about it from you!